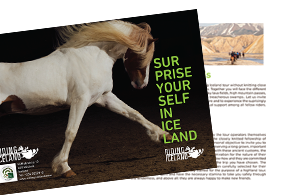 All Riding Iceland tours are planned and guided by the tour operators themselves and their families, welcoming you to be part of the closely knitted fellowship of horse friends in their country. They have made it their personal objective to invite you to follow the old Icelandic tradition of trail riding, thus preserving a long grown, important cultural heritage. All five of our tour operators grew up with these ancient customs, the love for the Icelandic horse and the respect and admiration for the vast wilderness of their country. On a Riding Iceland tour you will enjoy their know how and professionalism from morning to midnight. They are your guarantee for the quality of every detail in the trip you have chosen except maybe for the weather. The horses that will take part in this adventure have been carefully selected and specially trained for the purpose of a highland tour. They are in good spirit and have the necessary stamina to take you safely through the wilderness and above all: they, just as the tour guides themselves, are always happy to make new friends. 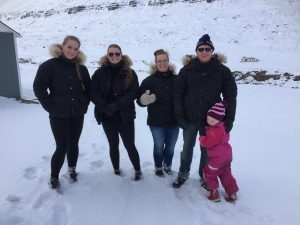 Bjarni Páll and Elsa, at Saltvík farm have been operating riding tours with their family for over 20 years, Their tour "Northern Exposure" has been one of the most popular riding tours in Iceland since the start in 1994 . This tour is now presented under a new name "The Diamond Circle" presenting the northeast Iceland with its most beautiful faces. From 1994 - 2000 Bjarni was guiding and operating for Ishestar the first organised riding tour crossing the whole of Iceland " the trail of Sprengisandur" Now Riding Iceland offers this tour again for riders seeking extreme experience of Icelandic wilderness. Saltvík is a family business and now theyr daughters , Iðunn, Arna Védís and Sigrún Anna are starting to take part in the tours helping out and training the horses between seasons! Elvar and Fjóla at Syðra-Skörðugil, Skagafjörður in the north of Iceland, are the new members of Riding-Iceland team. From the year 1940 Elvar´s family have been breeding horses so the farm has a long history of breeding and training horses. Their farming is based on rearing Icelandic horses and sheeps so when you come and visit you get to know a little about the farming at their home as well as getting to know the people and the Icelandic horse. 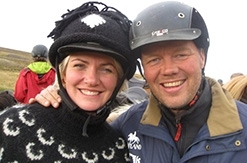 Every summer in about 15 years Elvar and Fjóla have been travelling on horses with groups of riders, both friends and customers, on riding tours in Skagafjörður. Skagafjörður is famous for the beautiful landscape and the hospitality of the locals.